Love Bite Pet Products is an innovative Brisbane based company that offers you affordable yet high quality stylish fashion for your pets. All products are made in America and some are exclusive to Love Bite Pet Products. 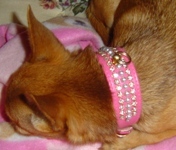 We offer diamontee cat and dog collars, leads, harnesses, soft harnesses and our NEW Tuff Dog Range. Please see our product Catalogue here on the left drop down boxes or contact us by email lovebitepet@hotmail.com. We look forward to assisting you in your pet needs.